Where: Norther Cycles 5515 N Albina Ave Portland OR 97217, and the PCC open air quad next door! Cost: free to the public, free to hang out, free to shop, free to after party at Norther Cycles! Sellers fee: $10 to set up a space and sell all your old crap... I mean sweet gently upcycled and very valuable and lovely vintage parts. (This fee covers advertising, we're not getting rich so help spread the word by sharing on all your social media! *Free for all students to sell! 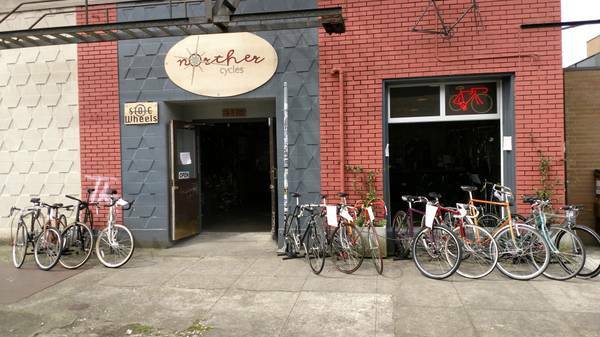 Fourth ever Norther Cycles Swap Meet! Rain or shine, but it's supposed to be a perfect 66 degrees and sunny all day. Hey, our last three swap meets were super fun, so we're having another one. Bring all your old bikes, parts and tools and sell them! Make people great deals, sell all your old junk, make cash, and then spend it on other people's sweet parts! Free to attend/buy all the sweet treasures, $10 to have a sellers space. Free for students. We have the whole PCC Cascade Courtyard again. This is a months notice, and yes I will be advertising this swap as much as possible, please tell all your friends and share on all your social media! Remember make it fun for everyone. Garage sale prices not high ebay prices. These means you will clean out your garage and make some pocket change, and everyone will get some sweet scores and we'll all have a huge amount of fun! Shop party after too so b.y.o beers too! There are two beer stores and lots of places to get lunch within a block of the shop! No you do not need to register or pre-pay or reserve a spot! It's a huge area and there is room for all. All you have to do is show up and spread the word so others will too! Set up is at 10 am. There is lots of free parking in the PCC lot behind the swap meet.